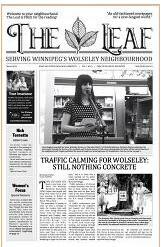 The Leaf is the community newspaper of Winnipeg's historic Wolseley neighbourhood. We are supported by entirely local advertising and subscription revenue. We receive no government or foundation grants. Please support local businesses and organizations, so they can support us. ​Advertisers: Contact Richard at leafbizpromotions@gmail.com to book your ad. ​Or check out a pdf of our ad rates here. Since January 2013 we have helped foster community conversation about a host of issues of interest to local residents; from people profiles and political views, to gardening tips, the arts and much more. We are also proud to now serve the vibrant and creative West Broadway community and new writers are always welcome to make enquiries. 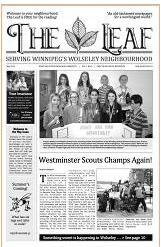 The Leaf is delivered door-to-door 11 times a year by a dedicated network of carriers. 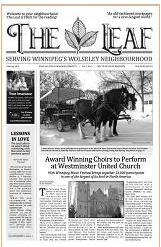 The Leaf is FREE; however, if you live outside of the Wolseley or West Broadway areas you may subscribe for $30 per year and we will mail your copy of The Leaf as soon as it is published. Click here, and provide your delivery details; we will e-mail a PayPal invoice you can use to pay. 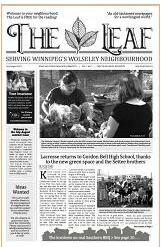 The Leaf provides a forum for both experienced and budding community journalists. All writers are paid, just like our carriers -- helping to foster local community economic development. Several times a year we host writing workshops where you can learn about writing articles. Check the paper for upcoming workshop schedules. 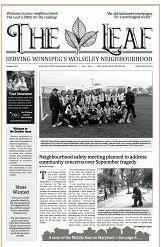 The Leaf provides a way for local businesses to engage in truly local marketing. Why waste money on high ad rates reaching neighbourhoods far outside your trading area? Target with The Leaf and save. Reach our advertising representative, Richard, at leafbizpromotions@gmail.com or from our general Contact page. In Treaty 1 territory, the traditional lands of the Anishinaabeg, Cree, Oji-Cree, Dakota, and Dene Peoples, and the homeland of the Métis Nation.